Hospital-acquired infections are a highly prevalent adverse events in the health care industry. Presence of unhygienic conditions in and around hospitals along with improper sterilization techniques applied in these settings augments the prevalence of hospital-acquired infections in the low and middle income countries. The global hospital infection therapeutics market is characterized by increase in incidence of infections of resistance bacteria. The market is witnessing gradual rise in research and development activities to develop novel antibiotics, which are supported by government policies. Hence, the global hospital infection therapeutics market was valued at US$ 14.4 Bn in 2017 and is projected to expand at a significant CAGR of 2.4% from 2018 to 2026. Increase in the geriatric population which is more prone to hospital-acquired infections, significant patient population in developing countries demanding proper treatment, and investments by public and private players for R&D on anti-infective drugs against resistant bacteria are the major factors driving the global hospital infection therapeutics market. However, surge in the incidence of treatment-emergent resistance, significant investment required due to high attrition rate in clinical trials, and changing reimbursement policies are resulting in limited pipeline drugs. This is likely to restrain the global hospital infection therapeutics market during the forecast period. 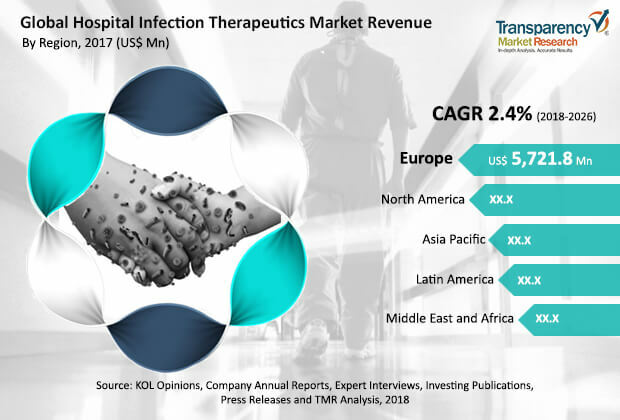 Investment in R&D on non-antibiotic treatment options and partnerships for co-development and commercialization of anti-infective agents are expected to fuel the growth of the global hospital infection therapeutics market. In terms of therapeutics, the global hospital infection therapeutics market has been classified into anti-bacterial drugs, anti-fungal drugs, anti-viral drugs, and others. The others segment comprises drug classes such as anti-parasitic drugs. The anti-bacterial drugs segment has been divided into cell wall synthesis inhibitors, protein synthesis inhibitors, and others. The cell wall synthesis inhibitors sub-segment comprises cephalosporins, carbapenems, vancomycin, and others. The protein synthesis inhibitors sub-segment comprises aminoglycosides, linezolid, tigecycline, and others. The anti-fungal drugs segment has been categorized into Caspofungin, Amphotericin B, and others. The others sub-segment includes Triazoles, fluconazole, voriconazole, and others. The anti-bacterial drugs segment is projected to dominate the market during the forecast period owing to an increase in initiatives such as the Global Action Plan on Antimicrobial Resistance by WHO and Drive AB by Innovative Medicines Initiative, and presence of key companies such as Merck & Co., Inc. and Pfizer, Inc. engaged in the manufacture of anti-bacterial drugs. These initiatives are aimed at increasing research and development activities to overcome drug resistance. The relatively stable growth rate of the segment is attributed to increase in antibiotic resistance of bacteria and limited pipeline drug candidates. The anti-viral drugs segment is anticipated to register above average growth rate owing to rise in the prevalence of severe bloodstream infections and increase in focus on research and development to overcome the risk of virus structural mutations. Based on infection, the market has been divided into hospital acquired pneumonia, urinary tract infections, gastrointestinal disorders, bloodstream infections, surgical site infections, and other hospital infections. The hospital acquired pneumonia segment is likely to dominate the market during the forecast period with above average growth rate, followed by surgical site infections, due to increase in incidence rate of respiratory infections among the geriatric population, comparatively above average cost of therapy, and prevalence of multidrug-resistant micro-organisms in ICU units. In terms of region, the global hospital infection therapeutics market has been segmented into North America, Europe, Asia Pacific, Latin America, and Middle East & Africa. Europe accounted for major share of 39% of the global market in terms of revenue in 2017. North America was another major market for hospital infection therapeutics in 2017. Relatively high cost of treatment compared to that in emerging countries, developed health care infrastructure, and larger reimbursement coverage which provides assured investment return for new market entrants contribute to the significant share of the two regions. However, high growth rate of the pharmaceutical industry in India and China and investment by global investors in China for development of novel treatment approaches for hospital-acquired infections are expected to propel the hospital infection therapeutics market in Asia Pacific. Major players operating in the global hospital infection therapeutics market include Merck & Co., Inc., Pfizer, Inc., GlaxoSmithKline plc, AstraZeneca, Johnson & Johnson Services, Inc., F. Hoffmann-La Roche Ltd., Bayer AG, Allergan plc, Sanofi S.A., Gilead Sciences, Inc., Basilea Pharmaceutica Ltd., and Bristol-Myers Squibb Company. This report studies the current as well as future prospects of the global hospital infection therapeutics market. Stakeholders of this report include companies and intermediaries engaged in the manufacture, commercialization, and provision of hospital infection therapeutics and new players planning to enter the market. This report comprises an elaborate executive summary along with a market snapshot providing overall information of various segments considered in the scope of the study. This section also provides the overall information and data analysis of the global hospital infection therapeutics market regarding leading segments based on infection, therapeutics, and region. The global hospital infection therapeutics market has been segmented based on therapeutics, infection, and region. In terms of therapeutics, the global market has been classified into anti-bacterial drugs, anti-fungal drugs, anti-viral drugs, and others. The others segment comprises drug classes such as anti-parasitic drugs. The anti-bacterial drugs segment has been divided into cell wall synthesis inhibitors, protein synthesis inhibitors, and others. The anti-fungal drugs segment has been categorized into Caspofungin, Amphotericin B, and others. Based on infection, the global hospital infection therapeutics market has been segmented into hospital acquired pneumonia, urinary tract infections, gastrointestinal disorders, bloodstream infections, surgical site infections, and other hospital infections. The bottom-up approach for determining the market size was employed using various market indicators obtained from secondary sources, which include population in 2017, prevalence of all types of hospital acquired infections in major countries, variations in therapy cost across major regions, and approval of therapeutics in specific regions. The top-down approach was used to derive the market size for therapeutics segments, wherein revenues of all publicly listed market players were obtained through secondary sources and analyzed for hospital infection therapeutics specific revenues by narrowing down to revenue percentage for therapeutics segment through extensive secondary analysis of annual reports, investor presentations, press releases, primary interviews, and others. Data triangulation is based on secondary research (top-down and bottom-up approaches) and primary research. Moreover, historical year-on-year growth has been taken into consideration while estimating the market size. The market size and forecast in terms of US$ Mn for each segment has been provided for the period from 2016 to 2026. The report also provides the compound annual growth rate (CAGR %) for each segment for the forecast period from 2018 to 2026, considering 2017 as the base year. The market overview section of the report explores market dynamics such as drivers, restraints, opportunities, and key trends that have significant impact on the global hospital infection therapeutics market and could influence it in the near future. Market attractiveness analysis has been provided to explain the intensity of competition in the market across different regions. The competitive scenario among different market players has been evaluated through market share analysis in the competitive landscape section of the report. These factors are likely to help market players take strategic decisions to strengthen their positions and expand their shares in the global hospital infection therapeutics market. The report also comprises of regulatory scenario by region/global, pipeline analysis, reimbursement scenario by region/global, disease prevalence & incidence rate globally with key countries, health care industry overview, value chain analysis, and porter’s five forces analysis. In terms of region, the global hospital infection therapeutics market has been segmented into North America, Europe, Asia Pacific, Latin America, and Middle East & Africa. The market size and forecast for each of these regions have been provided for the period from 2016 to 2026, along with their respective CAGRs for the forecast period from 2018 to 2026, considering 2017 as the base year. The report also provides market size and forecast for major countries in the respective regions. A detailed qualitative analysis of factors responsible for driving and restraining the market and opportunities has been provided in the overview section. This section of the report also provides the market share analysis by key players, thereby presenting a thorough analysis of the overall competitive scenario in the global hospital infection therapeutics market. Major players operating in the global hospital infection therapeutics market are Merck & Co., Inc., Pfizer, Inc., GlaxoSmithKline plc, AstraZeneca, Johnson & Johnson Services, Inc., F. Hoffmann-La Roche Ltd., Bayer AG, Allergan plc, Sanofi S.A., Gilead Sciences, Inc., Basilea Pharmaceutica Ltd., and Bristol-Myers Squibb Company, among others.